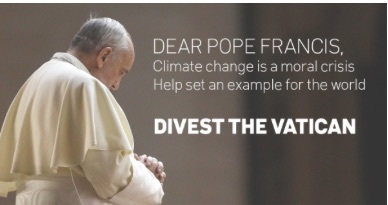 Simply put, a divestment is the opposite of an investment. Instead of acquiring something, say stocks in a company, you get rid of the stock. In the environmental movement, it refers to selling off stock you own in a fossil fuel company, or a company for which fossil fuels is a significant part of its business, either by exploring for it, refining it, extracting it, or selling it. The main argument for divesting from fossil fuel companies, and encouraging others to divest, is that the fossil fuels are harming the planet by producing greenhouse gases (GHGs) and global warming. One way to stop the exploitation of fossil fuels is to cut off the source of the money that the companies use to explore for or extract the fuel. A second argument is that as more and more organisations and governments place restrictions on the use of fossil fuels, and even the extraction of fossil fuels, those fossil fuels still in the ground or seas will become less valuable, even worthless, and the stock of such companies will become less valuable. This is called “stranded assets” or a “carbon bubble,” which will burst. So keeping stock in such companies is becoming more risky for investors. Thus, the cry for divestment. Analyse the divestment campaign against tobacco companies and/or South African Apartheid and compare one or both to the fossil fuel divestment campaign, in terms of goals, methods, participants and successes and failures. Choose one fossil fuel company and determine how much stock would have to be divested in order to have an impact on that company’s valuation. Besides financial impact on companies, what other impacts can divestment have on such companies. Have these non-financial impacts had effect in other divestment campaigns?